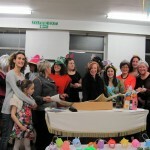 Hamps tead women had great fun leyning megillah Esther last night. We all worked very hard and now admire all our male colleagues who read from the Torah and Haftorah. We are very grateful to Dina Brawer who helped organise this event which including learning with Rabbi Michael Harris and Lyndsey Taylor Guthartz. Apparently it is Megillat Ruth next!